While at the old Sturbridge Villiage in central Massachusetts, Norms eye is drawn to this chair table. As with most antique furniture, craftsmen made their furniture pieces to serves more than one purpose. As this is no more evident than in a kitchen. Wood and/or Supplies needed: A fully detailed Materials List is provided in the plan. Tools needed: Bandsaw, table saw and other common workshop tools. Condition of this NYW plan: This is a woodworking plan we purchased in a wholesale lot. Excellent condition, new in package. Plan is printed on one sheet of 18 x 24-1/2 inch recycled paper. Standard measurements only (inches). Sorry, the designer does not produce a downloadable version of this plan. The New Yankee Workshop® on PBS® is a co-production of Morash Associates, Inc. and WGBH Boston. ©Morash Assoc., Inc., WGBH Educational Foundation and Linnor Inc. All Rights Reserved. This turned out better than I imagined. Thanks for the unique plan. 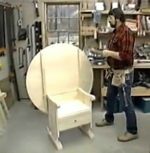 Potatoe Onion Bin Woodworking Plan. Perfect for storing potatoes, onions or even dog food. Hardware and decals are not included. Quilt Display Chest Woodworking Plan. This charming cupboard gets the step-back name from the fact that its upper section is shallower than the base. The Editors of Woodcraft Magazine teamed up with The American Woodshops Scott Phillips to create a pleasing table and bench ensemble in an updated Colonial style. Designed and developed to complement the Trestle Table, this second seating option works as stand alone seating for an entry or mudroom. This plan is for the country buffet. There are other plans in this collection that work great as a set or for stand alone pieces.